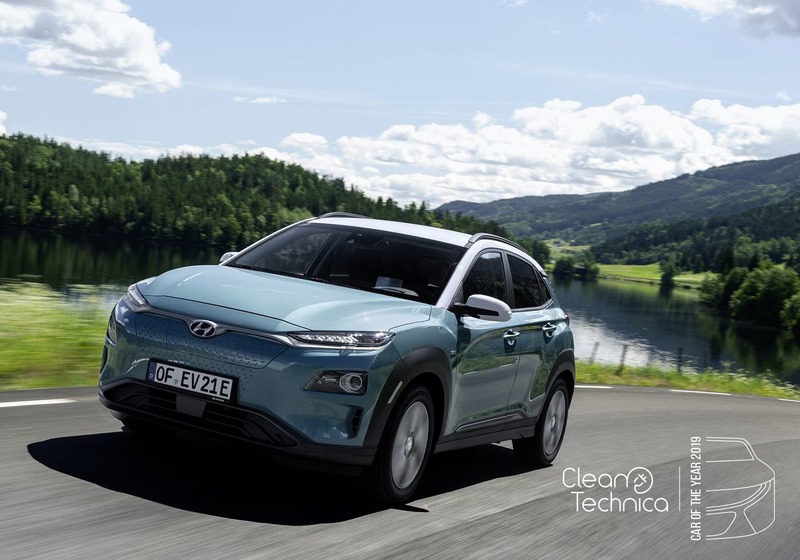 After reading fellow CleanTechnica writer Sebastian Blanco’s review of the Hyundai Kona EV, I knew I was in for a fun drive. I had no idea how much fun it would be, though. 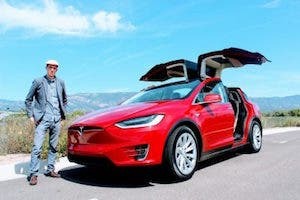 I walked away wondering how anyone could justify buying a daily gasoline driver when you can have a 258-mile electric crossover like this. I just test drove the Kia e-Niro as well, another 2019 finalist, and will have more to say about it soon. The Ultimate edition model I tested out showed up at my doorstep with an enthusiastic estimated 258 mile (EPA) range. However, I was able to squeeze a lot more out of it in city-only driving. Straight off the bat, as soon as I accelerated in Eco mode, I knew it was going to be a fun and spirited drive. It was even more of a hoot in traffic and on highways! 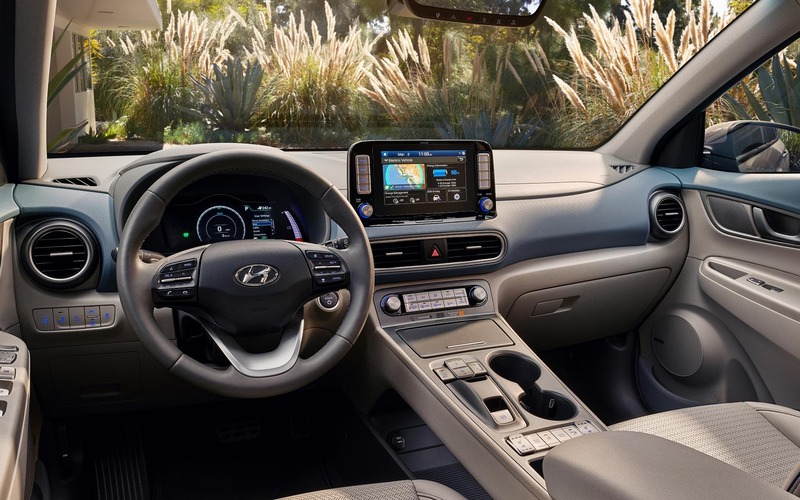 The Hyundai Kona EV “Ultimate” has a heated steering wheel, ventilated front seats, a heads-up display, a larger touchscreen, a premium stereo, and smarter cruise control, amongst other things, and all for $44,650. What more can you want? 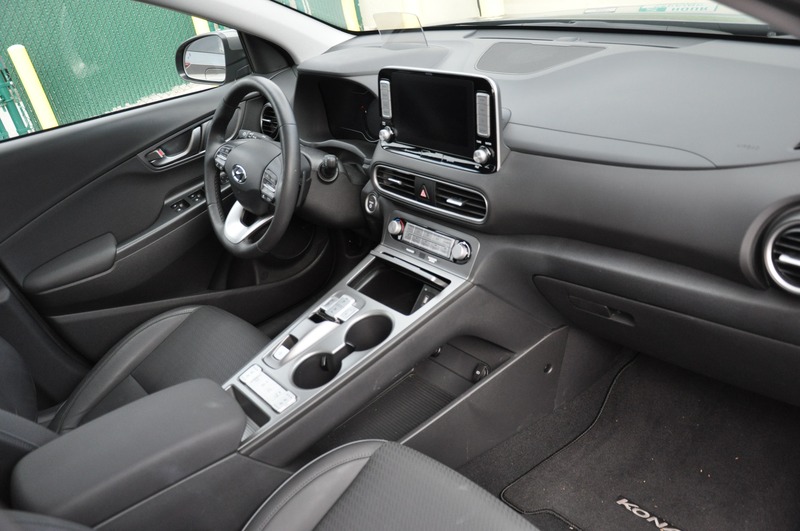 The 3 driving modes — Eco, Normal, and Sport — progressively release more torque. 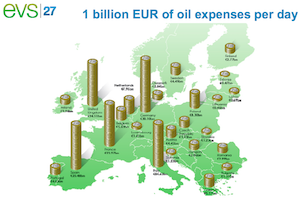 Eco has enough acceleration when needed. There were plenty of times I out-accelerated BMWs from a standstill, even on highways. The Normal driving mode raises the torque a bit more. But the Sport mode is when all 150 kW on the front wheels create a healthy helping of extra fun. Hyundai says the Kona EV will sprint the 0–60 mph run in 7.6 seconds, but the company doesn’t say that the first 40 mph is the most exhilarating. For a crossover, the Hyundai Kona EV shows little body roll. The ergonomics are good and everything falls into hand easily without much hunting. The vehicle shares the same DNA as its Kia Soul relative. In fact, I made my 6’4” tall German friend sit inside. Even with the front passenger seat pulled all the back, he had enough knee room. 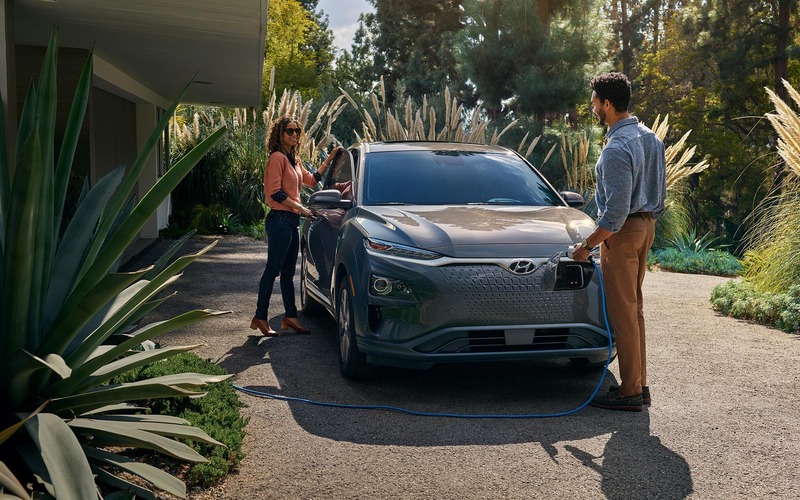 Another nifty addition Hyundai gives us in the Kona EV is adaptive regenerative braking that lets you use the smart adaptive cruise control and have the car slow down using the regenerative braking system before accelerating again. And yes, not everyone will use this, but I can see many stop-and-go traffic drivers making copious use of the feature. 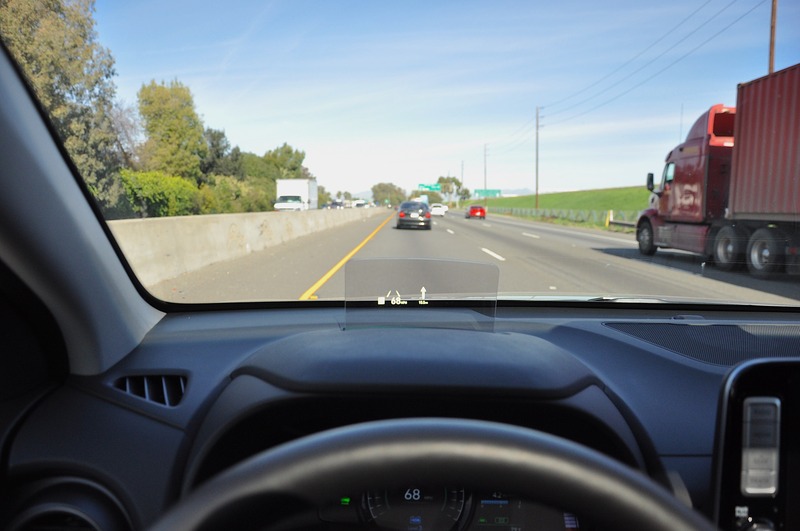 Add in the heads-up-display (HUD) that can be tilted or made brighter and you can see that this car becomes fun to drive in almost any traffic condition. 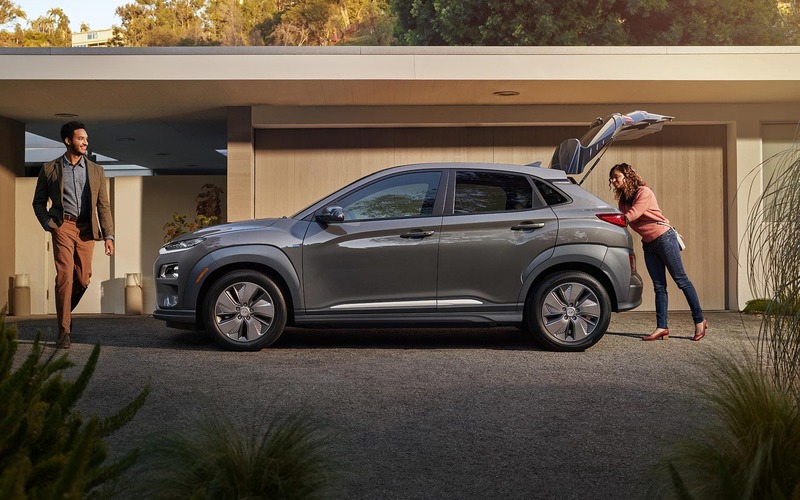 The Hyundai Kona EV comes standard with a 7.2 kW onboard charger to charge a fully depleted battery pack in 9.5 hours. A CCS 50 kW DC fast charger cuts that down to 75 minutes, and a 100 kW superfast charger cuts it down to 54 minutes. No car is perfect. That much we can all agree on. As much as I thoroughly loved driving the car, there are a few nagging things that will need to mature over time. The amount of wind noise on highways surprised me. It wasn’t intrusive, but just enough to make me wonder about long-distance driving. Although, the car more than makes up for it with frank acceleration in any driving modes. The Sport mode will overwhelm the front tires. The Hyundai Kona EV has a lot of torque steer underneath and its Nexen NPRIZ AH8, 215 x 55 tires have a difficult time maintaining traction under hard acceleration. In fact, and for fun, I was able to spin those tires up to 40 mph, a testament of the zippiness of the Kona EV. The front charge port feels a little flimsy. It makes me wonder how it would handle a front shock and how easy it would be to still use it. In the nitpicking department, the drive mode selector could be easier to reach. It is positioned in front of the elbow, which means taking your eyes off the road and hunting for it. 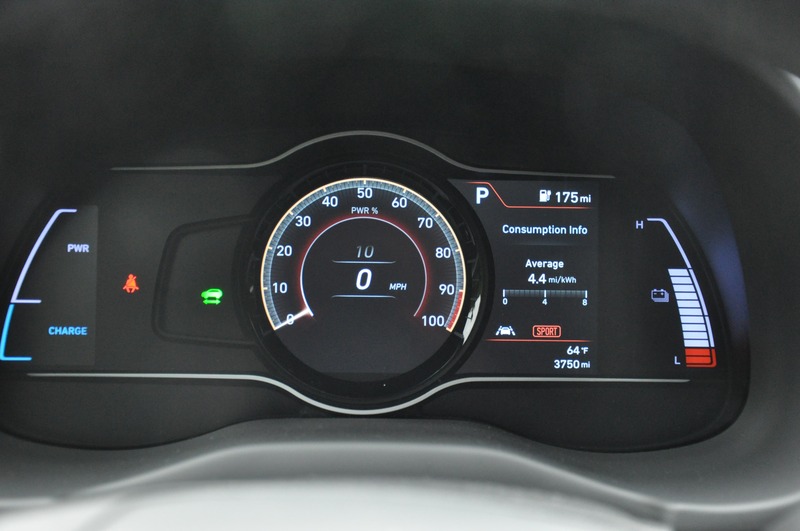 I feel most EVs should have drive mode selectors on steering wheels, but that’s really nitpicking. 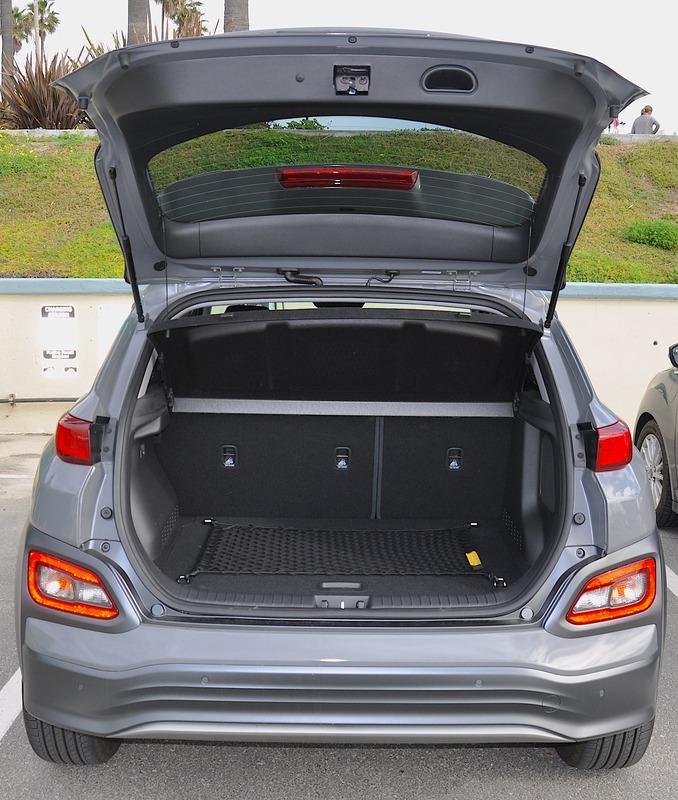 The Hyundai Kona EV manages interior space well with a decently sized rear cargo space. 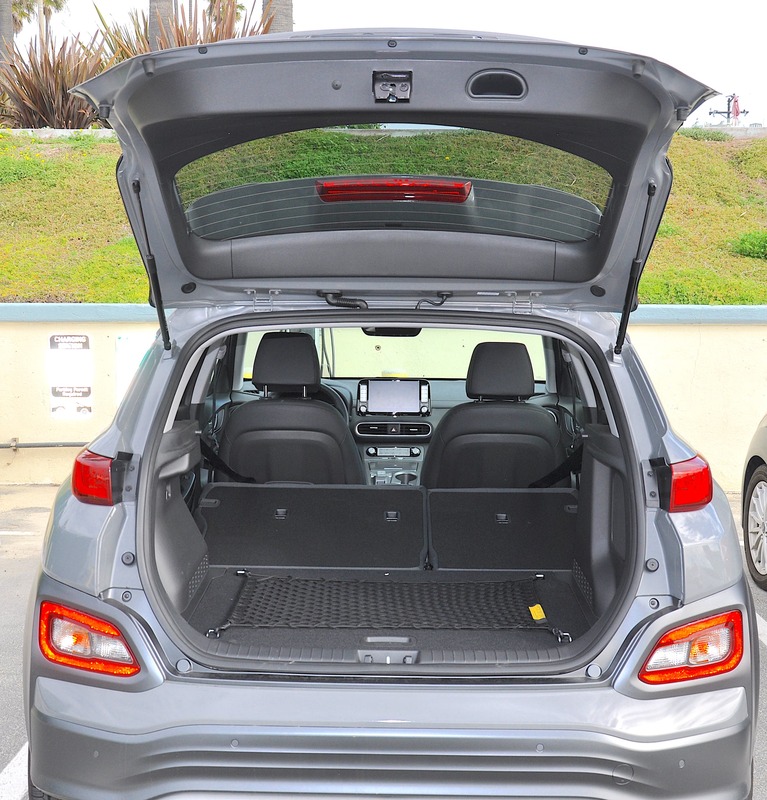 The trunk offers 19.2 cubic feet of cargo space, slightly less than the LEAF’s 23.6 cubic feet, but more than the Bolt’s 16.9 cubic feet. 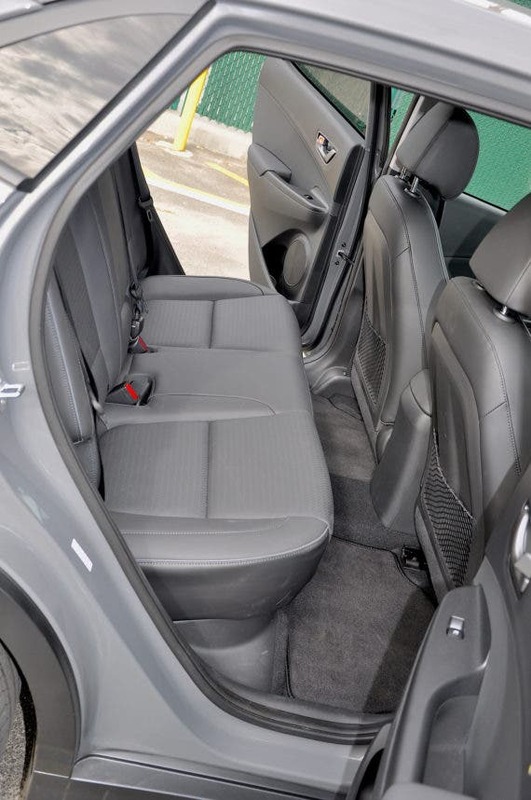 The rear seats are comfortable enough to drive two to three extra people in relative comfort. My apologies: I called the Hyundai Kona EV the Niro EV in the video. In my lame defense, I was giving the keys back to Hyundai and about to test drive the Kia Niro EV. At the time of editing the video, I just finished test driving the Kia Niro EV. Insert a blush and my sincere apologies to Hyundai! 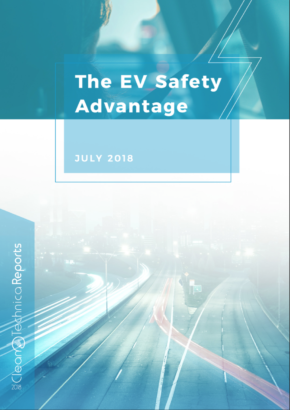 The competition in the 200+ mile EV segment is heating up. 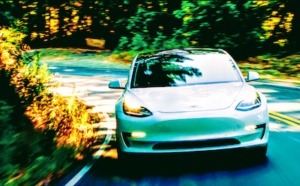 The Chevy Bolt is on its second year, the new Nissan LEAF e+ is coming out, and the Tesla Model 3 was already the world’s #1 EV in 2018 and was the #1 luxury vehicle in the US. 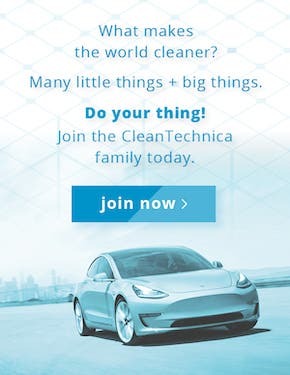 We’ll have to wait to see what happens as other carmakers give us more choice. 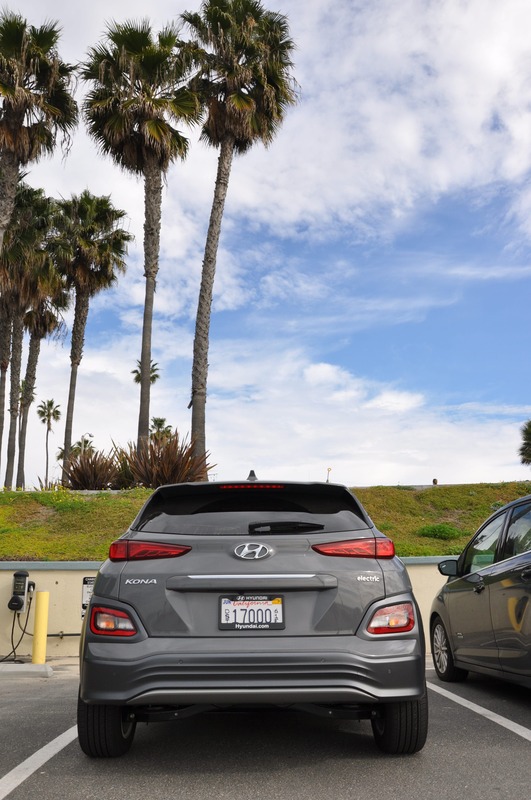 I walked away from my time with the Hyundai Kona EV questioning why anyone would buy a gasoline daily commuter when you can have this vehicle and its 258 miles of range. The Hyundai Kona EV can easily give 300 miles of range in city-only driving and offers enough room for four people as well as decent cargo capacity. 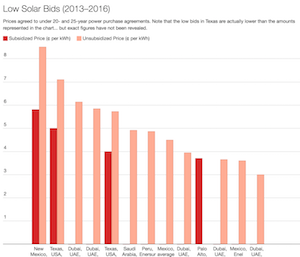 Hyundai does a great job at packaging the Kona EV, and at $38,000 before any incentives (like the $7,500 EV tax credit), it will hopefully find a lot of happy buyers. I give the Kona EV a 4.75 plug rating (or 5 if you round up). This is one EV I could see myself driving daily.